I was really stuck between a 3.5 and a 4.5 when I first finishedSecrets That Kill. It's a BIG range, but there was one element that was fairly dominant in this story that I didn't like. At the same time, I LOVED the action and setting. In the end I landed on the middle with 4 stars. Wendy Tremont King continues to be a pretty good narrator withSecrets That Kill. A few Hispanic accents popped up again and she really doesn't know what to do with them. I find it funny, though, and it doesn't actually hurt the reading for me. Otherwise, she's a solid voice for Shelby the MC. 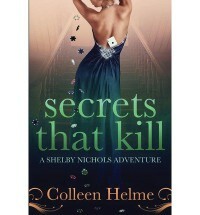 I really love Shelby's personality and it continued strong inSecrets That Kill. As always it's her obsessive need to help everyone that gets her into trouble - she's just TOO good for her own good sometimes. The one thing that really bothered me inSecrets That Kill was the way she entertained thoughts about Ramos. It felt really out of character for Shelby - even though she always pushed those feelings away because she knew that she loved Chris, it just didn't jive with the Shelby I know. I know that it's perfectly natural to admire someone attractive and when they get thrown together as much as Shelby and Ramos did in Secrets That Kill it's probably bound to come up a bit more. But it went a bit further than felt right to me for Shelby. I think I also really missed the family element in Secrets That Kill. You get some phone conversations with Chris, but none with the kids. I guess after seeing Chris come so far in the last book, I wanted more of that -- Chris and Shelby together and against it all -- but got Shelby flying more solo than ever before. I did really enjoy that we got to know Ramos so much better inSecrets That Kill -- I've always liked him as a character and it was really great to get his back story. And even though it threw me for a loop, I have to admit that if it weren't something that felt out of character for Shelby - I DID like the little bit of awkwardness and tension between her and Carlos (which is why I'm still giving this 4 stars, rather than knocking it all the way down to 3.5). The story for Secrets That Kill was particularly strong. It kicks off with Shelby getting ready to head home from the family's vacation in Florida - but first she has to make a delivery for Uncle Joey. And in a spectacularly Shelby fashion it get WAY out of control. Before you know it, her life's in danger and she's playing high stakes poker (and with a mind reading ability, that's super cool!). The element of being on vacation - but without her bags - really gave this a fresh feel for the series, nothing felt too familiar - which could easily happen at this point in the series. I did miss some of the mystery elements - this didn't really seem to have one honestly - but the adventure was tons of fun and Shelby continues to keep everyone - including me - on their toes. I've come to love this series and I'm eagerly anticipating the release of the next book to audio later this month.